SANGER - Brandon Zenimura, an educator at Sanger High School, has been selected from a pool of more than 400 applicants to participate in the Library of Congress Teaching with Primary Sources Summer Teacher Institute for the week of July 7-11, 2014. Each year, the Library of Congress provides the opportunity for a carefully chosen group of K-12 educators to attend one of its five teacher institutes in Washington, D.C.
During the five-day program, participants work with Library education specialists and subject-matter experts to learn effective practices for using primary sources in the classroom, while exploring some of the millions of digitized historical artifacts and documents available on the Library’s website. 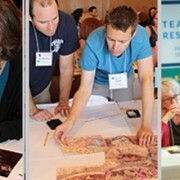 Educators attending the teacher institutes develop primary-source-based teaching strategies that they can take back to their school districts, apply in the classroom and share with colleagues. Teaching with primary sources is a powerful way to help students ask engaged, probing questions, develop critical-thinking skills, and gain knowledge. All educators can access classroom materials, teaching tools and strategies for teaching with primary sources from the Library’s site for teachers at www.loc.gov/teachers/. Applicants to the Teaching with Primary Sources Summer Teacher Institutes reflect the diversity of the world of K-12 education. Participants in a teacher institute session typically include school library media specialists and school administrators, in addition to classroom teachers. Those selected come from many different states, representing large metropolitan school districts and smaller, rural school districts. The expertise provided by the Library of Congress during the institutes can benefit every level of K-12 education. Primary sources are the raw materials of history — original documents and objects that were created at the time under study. They are different from secondary sources—accounts or interpretations of events created by someone without firsthand experience. Students working with primary sources become engaged learners while building critical-thinking skills and constructing new knowledge. Teachers working in the Library’s collections will explore the largest online collection of historical artifacts with access to millions of unique primary sources for use in instruction.